Kings Insulation - Home Insulation Perth, Energy saving Perth, Skylights Perth, Insulation batts Perth, Roller shutters Perth, Downlight guards Perth. 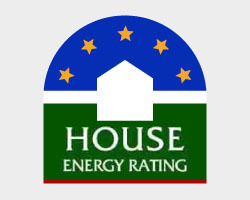 What is House Energy Rating? It is an index of a building's thermal performance (i.e. heating and cooling requirements) for residential homes in Australia. Home energy ratings can be used for either existing homes or new homes. A home energy rating of an existing home allows a homeowner to receive a report listing options for upgrading a home's energy efficiency. The homeowners may then use the report to determine the most effective ways in which to upgrade the home's energy efficiency. A home energy rating of a new home allows buyers to compare the energy efficiency of homes they are considering buying, as well as specifying the insulation ratings that need to be used. the orientation of windows and shading to the sun's path and local breezes how well these suit the local climate. Zero stars means the building shell does practically nothing to reduce the discomfort of hot or cold weather. A 5 star rating indicates good, but not outstanding, thermal performance. Occupants of a 10 star home are unlikely to need any artificial cooling or heating.